Most guys love talking about sports cars. But talking about cars and taking an engine apart are two different things. I’d be in trouble if I had to put a car engine together from scratch. I know enough about sports cars to spot a fast one when I see it. The more horsepower, the more torque, the better. Add a turbo booster, and now you’ve got my attention. Similarly, you don’t have to be able to build a computer to know what makes a trading computer fast. Most people can guess having a high-speed processor (or CPU) makes a computer faster. But just like both horsepower and torque determine how fast a car will go, there are a couple of key CPU specifications that determine how fast your computer can pop up a stock chart or execute an order. These are your processor’s clock speed and its cache system. The number one reason computers differ in price is their clock speed. You’re probably more familiar with the term CPU (or processor) speed. But once you know where this name comes from, you’ll see that clock speed is the technically correct term. You probably get flyers via snail mail from office stores and computer retailers advertising Intel and AMD processors with clock speeds like 2GHz (GigaHertz) or 3.7GHz. What does that spec even mean? Is a higher ‘GHz’ number worth the money? These numbers refer to how quickly your computer processor can execute a list of instructions (i.e., a computer program). The computer’s internal clock regulates this speed of execution. The CPU requires a certain number of clock ticks (or clock cycles) to execute each instruction. Clock speeds are expressed in GHz, where 1GHz is 1 billion cycles per second. So if the clock is running faster, numbers are getting crunched faster. However, this doesn’t tell the whole story. Intel and AMD have been in a space-race to have the fastest clock speeds because that number helps them sell new computers. But what few buyers realize is this: the way the chip is designed matters just as much as the stated clock speed. A computer with a 2Ghz processor is going to be faster than one with a 1GHz processor. However, it is not necessarily two times faster—it depends on the chip design. Not only that… you must factor in all the other computer components (not just the CPU) to know how fast a computer will feel when you use it. Some of these include system memory, overclocking, and caching. Caching has nothing to do with speed directly. Cache (pronounced like ‘cash’) is simply a temporary storage space. Caching helps your processor to work faster by providing temporary places to store intermediate calculations and information it is likely to need again shortly. This saves the processor from having to re-do calculations or having to retrieve data from permanent storage (which takes longer). Modern computers usually have two levels of Caching. This is plainly called ‘Level 1 Cache’ and ‘Level 2 Cache’. Having two levels of cache helps speed things up when your computer gets really busy. For example, these two levels get heavy usage when you have a lot of requests from a volatile trading day with lots of price action. Level 1 Cache provides the fastest data transfer, but it’s super-expensive. Your processor uses this cache first, up until the point where it’s full. Level 2 Cache isn’t as speedy. However, it’s attractive to include more Level 2 caching in your processor because it’s cheaper. 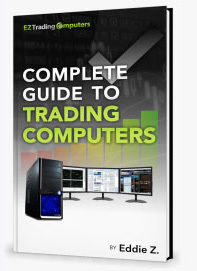 You don’t have to be able to put together a computer to be a trader. Trading is your business, and that’s where you want to spend your time. But a speedy trading computer is part of your recipe for success. Understanding what makes it go faster only makes sense. In fact, understanding the basics helps you avoid wasting money. I know that confusing traders with nerdy specs is one way my competitors try to rip you off. Don’t buy the hype. Be an informed trader. Be an informed computer owner. And keep more of your money.